LCD 16characters x 2lines : LCD-STN negative blue type is white character on blue background. LCD text & numeric display interface to I2C bus are SCL and SDA. Including Microchip MCP23008 : 8bit I/O port expander with serial interface which can interface to several devices up to 8 devices on one bus. Each device must have a different address, three address pins, high-speed I2C interface 3400KHZ, voltage supply 1.8V to 5.5V, current 1mA. Support LCD Contrast Adjustment with fine adjustment of a trimpot to any desired contrast setting. Support LED Backlight-White to turn on or turn off LED backlight with program control LED backlight to save power. Including Pull-up Resistors to "pull-up" the signals to prevent SCL line & SDA line from floating. Pull-up resistors set default value (5Vdc) when there is no signal at the input. Including Libraries and Examples for learning quickly. Including a I2C Bus Connector to connect other boards on I2C bus are SCL line and SDA line. I2C bus connector consists of +5V, SCL, SDA and GND pin. Including I2C Bus Cable to connect other boards on I2C bus. Including JP6 Jumper to write data to LCD or read data from LCD. Operating voltage of I2C LCD Blue Board is 5Vdc. Board Dimension is 36.0mm(Width) * 80.0mm(Long) * 23.0mm(High). Trimpot Variable Resistor 10KΩ ± 10%, 0.5w to fine adjust LCD contrast to any desired contrast setting. JP4 Jumper & JP5 Jumper (Default) connect to pull up resistors for enable pull up resistors to "pull-up" the signals to prevent SCL line & SDA line and set default value (5Vdc) when there is no signal at the input. * If your another board have I2C bus system is pull up resistors that recommend you should be de-solder JP4 jumper and JP5 jumper to disable pull up resistors of I2C LCD Blue Board. * SCL is a serial clock line and SDA is a serial data line. Microchip MCP23008 provides 8bit I/O port expander with serial interface which can interface to several devices up to 8 devices on one bus. Each device must have a different address, three address pins, parallel I/O expansion for I2C bus or SPI applications, high-speed I2C interface 3400Khz, voltage supply 1.8V to 5.5V, current 1mA. A2, A1, A0 Jumpers will be set device address to interface your device. This I2C LCD Blue Board sets address = 0 (Default). A2, A1, A0 jumpers are disable. * If you must have interface to several devices up to 8 devices on one bus. Each device must have a different address and must solder A2, A1, A0 jumbers (Optional address = 0 to 7). A2, A1, A0 jumpers are enable. I2C Bus Connector to connect other boards on I2C bus are SCL line and SDA line. I2C bus connector consists of +5V, SCL, SDA and GND pin. JP6 Jumper will be set RW pin to write data to LCD or read data from LCD This I2C LCD Blue Board sets default to write data to LCD by solder JP6 jumper to connect GND. RW pin is cleared (0). * Optional is set RW pin to read data from LCD by de-solder JP6 jumper to disconnect GND. RW pin is (1). Pin Header 16pins connect between I2C and LCD. LCD 16characters x 2lines, LCD-STN negative blue type is white character on blue background, transmissive rear polarizer, 16x2 display format, 5x8 character format, 2.95x5.55mm. character size, LED backlight-white backlight, 62.2x17.9mm. viewing area, -20°C to +70°C operating temperature, 5Vdc voltage supply, 0.55x0.65mm. dot size, parallel Interface, white dot/blue background power on appearance. LCD text & numeric display interface to I2C bus are SCL and SDA. I2C LCD Blue Board for Arduino = 1 pc. Free a I2C Bus Cable = 1 pc. Free CD (schematic, example programs, full manual and etc.) = 1 pc. 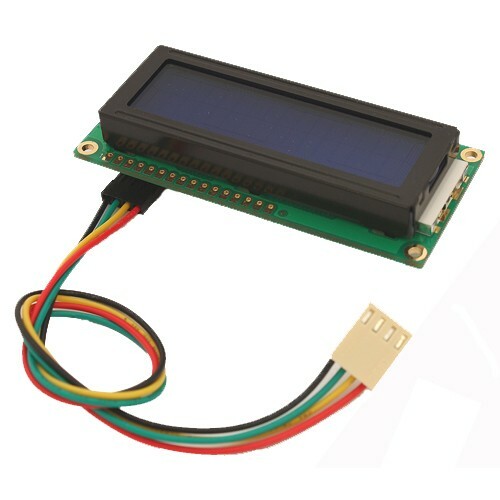 Connect this I2C LCD Blue Board to your arduino motherboard with I2C bus cable. 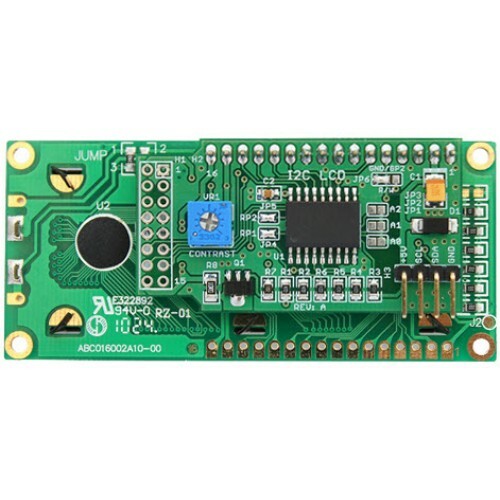 * If you have our product is “SD Card Shield Plus for arduino” you can connect I2C LCD Blue Board to SD Card Shield Plus with I2C bus cable. Double click on icon “Arduino ” program (Or double click “Shortcut to arduino” on your desktop) to open arduino on your computer which a free CD includes LiquidCrystal_I2C libraries and example programs. Open an example program is “HelloWorld_I2C program” to will be tested this I2C LCD Blue Board is choose “File>Examples> LiquidCrystal_I2C > HelloWorld_I2C”. After opened an example program is “HelloWorld_I2C program” will be shown detail of the C language code. Choose “Sketch>Verify/Compile” to verify and compile C language code. If C language code is correct and not found data error then information will be shown “Done compiling” and “Binary sketch size”. Choose “File > Upload to I/O Board” to upload program into your arduino motherboard. If completely uploaded an example program (ReadWrite program) then information will be shown “Done uploading” and “Binary sketch size”. Upload an example program is “LiquidCrystal_I2C>HelloWorld_I2C” into this I2C LCD Blue Board. 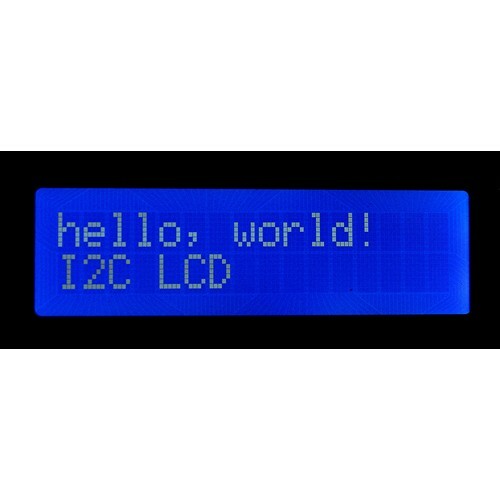 If completely uploaded an example program is HelloWorld_I2C program then LCD Displaying of text & numeric character will be shown “hello, world! I2C LCD”.